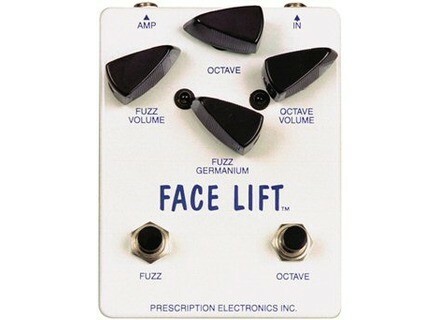 Face Lift, Other guitar saturation effect from Prescription Electronics. 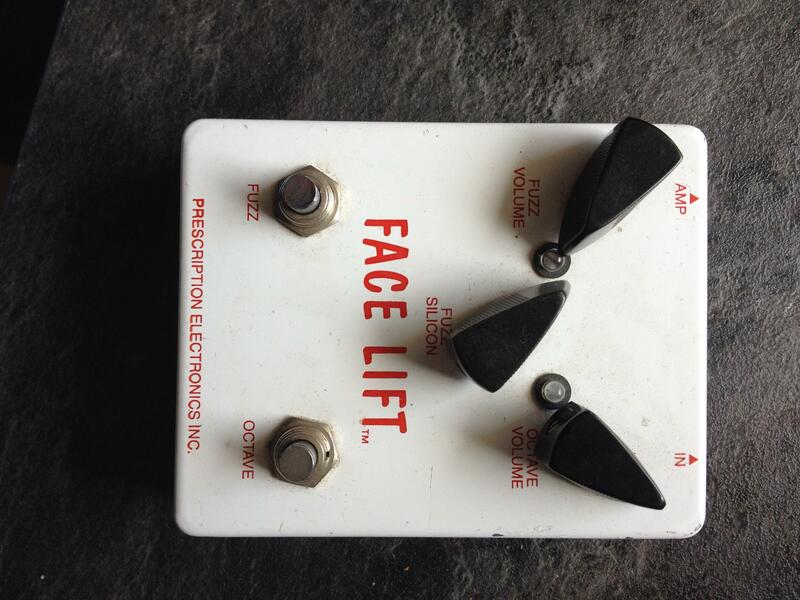 The Prescription Electronics Face Lift is a fuzz overdrive pedal for guitar. This is pretty much the same kind of pedal as the classic Fuzz Face. I think that it's an analog pedal, but it definitely has a 1/4" input and output and can be powered by a 9 volt supply, a standard configuration for pedals indeed. It isn't rack mountable since it's a foot pedal. It's easy to follow the Prescription Electronics Face Lift. 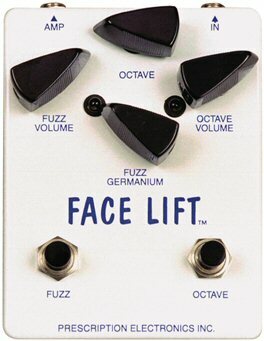 There are parameters for fuzz volume, fuzz germanium, octave, and octave volume. It's definitely a unique pedal when compared to the rest of the fuzz universe, but once you see what each of the parameters does, it becomes pretty clear how to use it. Once you mess with it for a little bit you should get the hang of it and not have a need for the manual. I really dig the sound of the Prescription Electronics Face Lift! It's one of the thickest and milkiest fuzz pedals I've used and is definitely reminiscent of the Fuzz Face and other old school fuzz pedals. It's awesome for leads and rhythm parts alike, but definitely excels in situations where you're looking for a crazy or scattered fuzz sound, if you know what I mean. It's an awesome tool in the studio for sure, and of course in a live setting too if you think you're going to be using fuzz on a consistent basis. Prescription Electronics isn't the most well known pedal manufacturer, but those that are aware of them understand that they make top quality products, and the Face Lift pedal is definitely a good example of their work. It's not going to be the cheapest fuzz box, but it's going to be one of the best you've ever used. There's always a tradeoff there, so if you want an awesome fuzz box, I'd suggest spending the extra dough and getting something spectacular like the Face Lift.